Westover is fashioned out of a former stable or coachhouse, the only remaining structure of one of Victoria’s great estates, The Leasowes. It originally accommodated up to six carriages and a number of horses. This 1½-storey structure has a wide, shallow hipped roof with two large gabled dormers perpendicular to each other. It has an one-storey hip-roofed extension on the left rear corner with unusual 12-over-three windows. There were originally sliding stable doors under the dormers, one of these has become the main front entrance. The balustrade on the balcony above the entrance was designed to imitate the vent headers in the gables; the vents vented the haylofts. The dormers are decorated with stickwork over the drop siding, that covers the entire structure. Six-over-one double-hung sashes with horns were added on the main floor to complement original six-over-six upper floor windows, and to replace horizontal windows at horse-head height. Contractor Thomas Catterall (b. Liverpool, ENG 1843-1919) lived at 1012 Pemberton Rd, Rockland (demolished), then at 1336 Beach Dr, Oak Bay. 1904-11: Bert Todd (721 Linden Av, Rockland) built The Leasowes, complete with a substantial stable, for his widowed mother, Rosanna (née Wigley, 1839-1931), and sisters, Mae and Nellie. It was named for a family home in Staffordshire, ENG. Mae married John Hebden Gillespie of Highwood (1021 Gillespie Pl, Rockland) in 1905. Nellie married his brother Alexander in 1907, and both couples moved out. Bert lived here with his mother until his marriage in 1910, but according to family she was lonely for her daughters and hated the huge house. In 1911 Rosanna auctioned off the property and moved near her daughters, into 1972 Fairfield Rd, now 423 Chadwick Pl, Gonzales, which she also called The Leasowes. 1911-38: James Dunsmuir (1852-1920) and Laura Miller (née Surles, 1858-1937) bought the estate and renamed it Westover, to use as their pied-à-terre in the City; their primary residence was Hatley Park in Colwood. Born at Fort Vancouver, WA, as his parents, Robert and Joan Dunsmuir (1050 Joan Cr, Rockland) were coming from Scotland to Vancouver Island with HBC, James spent his early childhood in Nanaimo, and completed his education at a military college in Blackburg, VA. Laura, a member of the prominent Byrd family of Virginia, was born in another Westover, one of the great Colonial Georgian mansions. She was completing her education in Hamilton, ON, when she met James. They married in 1876. Upon his return to Vancouver Island, James joined his father’s coal mining firm, and took over the family businesses almost entirely after his father died in 1889. The family first lived at his parent’s former home, Fairview (demolished) in James Bay, then built Burleith (destroyed by fire) in Victoria West in 1891-92. James was elected MLA for Comox in 1898, and for Newcastle in 1900. He became Premier of BC that year, but resigned two years later because of a controversy over railway policies. From 1906-09 James was BC’s Lt.-Gov., but was criticised for his refusal to give Royal Assent to anti-Asian legislation, because his company was using cheap Chinese immigrant labour. During this period Hatley Park was constructed in Colwood. James retired after the death of their son Lt. James “Boy” Dunsmuir when the Lusitania was torpedoed in May 1915; he never recovered from that loss. Laura was active in charitable organizations and social clubs and was the first honorary president of the Women’s Canadian Club. She died at Hatley Park in 1937. In the late 1920s Laura loaned Westover to daughter Kathleen and husband A. Seldon Humphreys, so that their children could attend school in Victoria. Kathleen held many parties on the large estate, but in 1929 they moved to their new house at 1621 Prospect Pl in Oak Bay. Kathleen was a dedicated worker during both World Wars. During WWII she ran a travelling canteen for Canadian soldiers in Farnborough and Aldershot. She was killed in 1941, during the Blitz. While entertaining family and friends at her son’s engagement party in the London nightclub Cafe de Paris, it took a direct hit during a German bombing raid. Tenants: 1917-20: Chauffeur John William Thompson Johnston (1871-1951) and Jeannie Robson (née Martin, 1873-1924), both from Aberdeen, Scotland, lived above the stable. John, who was later a bus driver for BCER, left the house after Jeannie’s death. 1931: Gardener Samuel James McClean (1878-1954) and his wife Jean (Dunlop). Owners: 1938-68: May France (née Montgomery, 1882-1968) came to Victoria from Britain in 1913 and worked for the Dunsmuirs as nanny to their youngest daughter Dola. In England and Tokyo, May had worked for several high-ranking Japanese families, including Prince Tokugawa. In 1918 she married Herbert Henry France (c.1888-1938), a repairman with Thomas Plimley. She left her job and they moved to Sidney where he died of cancer. 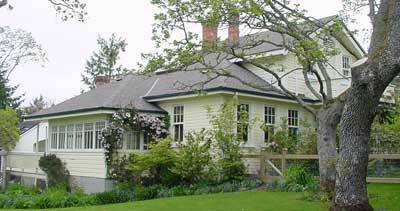 The Dunsmuir family gave the remodelled Westover stable to May as a home for herself and son Gordon. The Dunsmuirs then sold the main house and remainder of the property to the city for unpaid taxes c.1941, and the big house was demolished in the late 1950s. In 1957, May remarried, to widower Robert Percival Sterling Twizell (1875-1964), a retired architect. He and his brother George Sterling Twizell, both born in Newcastleon- Tyne, ENG, came to Vancouver c.1908. The partnership of Twizell & Twizell lasted until 1954, although George retired to Esquimalt in 1950. They designed a number of prominent houses in Shaughnessy Hts, and many schools and churches. Robert moved to Victoria after his first wife died in 1957, and George died that same year. Robert and May went on a five-month honeymoon to Europe, then moved back into Westover and made further renovations. 1969-70s: J. Lawrence and Shirley Northey from Calgary hired architect Peter Cotton to turn the entire stable building into a home.